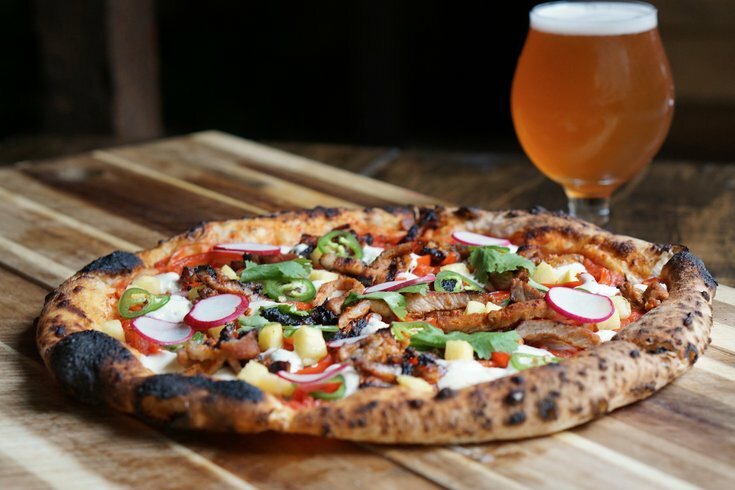 The Al Pastor Pizza — made with marinated pork shoulder grilled over fire, tomato-red pepper sauce, mozzarella, diced pineapple and jalapeno and finished with fresh cilantro, radish, pecorino and extra virgin olive oil. Update: Cinder's soft opening begins Nov. 10 at 4 p.m.
Back in late March, we announced that Cinder would be coming to Rittenhouse. The cider bar and restaurant concept was dreamed up by Teddy Sourias, the U-Bahn and BRU Craft & Wurst owner. Months later, it looks like the restaurant is anticipating an opening date in early November. Big cider fans may want to keep an eye on Cinder's Facebook page, where more news will be shared on the restaurant's progression as it happens.